In orthodontic practice, one common complaint that the dentist faces is correction of rotated teeth. After the correction of the rotation is complete and the teeth are in alignment, it is imperative that this derotation is maintained through a proper retention protocol. This article thus discusses the reasons why we have rotated teeth, different types of solutions to solving these problems, old and new treatment modalities, problems associated while carrying out these treatments and how to retain these treatments. 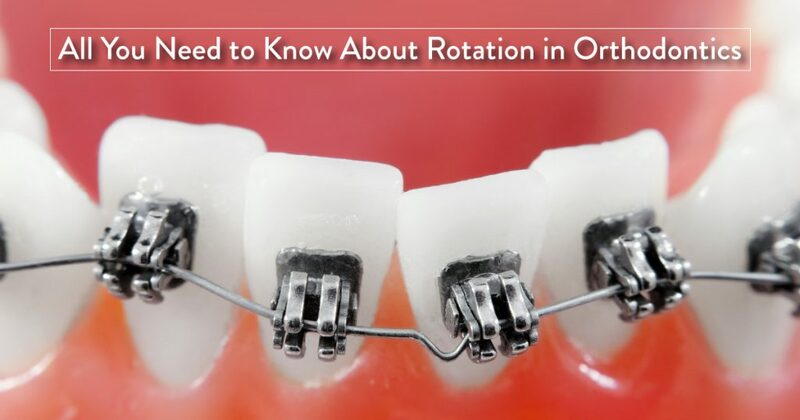 Now, rotations are a common cosmetic complaint made by patients who visit orthodontic practices the world over. If the rotation is present in the upper anterior teeth, it is very visible and a cause of concern for the patient. That may be the patient’s chief complaint. Fortunately, this problem is correctable using a plethora of options from orthodontics and cosmetic dentistry. In this article we will focus on the orthodontic options available to us. Typical class 2 division 2 malocclusion, where the upper centrals are lingually inclined leaving insufficient room in the dental arch. Different types of forces acting on teeth like masticatory forces, forces from tongue, digit sucking habit, lip biting, etc. Unilateral cleft where usually teeth lateral to the cleft are rotated. Rotated teeth are known to occupy more space in the arch. Thus, when the patient exhibits overcrowding in the arch, derotation is one of the methods of space gain. Thus, overcrowding can be partially resolved by derotation. This is of particular importance, especially in the posterior teeth where space gain can give us the ideal results that we are looking for. If a patient regularly visits the dental clinic, the dentist can closely monitor these cases both clinically and radiographically, so that the etiology of these malocclusions can be detected and these problems can be intercepted at an early age (interceptive orthodontics) when the case is referred to the consultant orthodontist. In cases where the patient is a teenager or an adult patient presenting rotations visiting the orthodontic clinic, they are treated as routine orthodontic cases. These cases require extensive biomechanics and do have a tendency to relapse if proper retention techniques are not followed. Force required for derotation is variable from case to case. Mostly, these cases are treated as routine orthodontic cases as there is very little awareness about these problems among patients, and they don’t realise the importance of interceptive dental treatment. The most common method of derotation is use of the very reliable NiTi wire. At the onset of the treatment, a very thin gauge NiTi wire can be used. For example, 012 NiTi can be used as the archwire to engage the brackets fully so that the derotation can start as early as possible. A NiTi wire can be used because of the very low forces that it applies over very large distances because of its properties of shape memory and superelasticity. Eventually the wire will bring about derotation of the teeth and more concrete steps can be taken in this direction, if required. Simultaneously, leveling and alignment is also carried out. Also, if derotation is not the primary request of the patient as against alignment of crowded teeth, then this is the preferred technique. The occurring torque movements are quite moderate and the forces from the eccentric bends can be intercepted by the existing leveling arch. NiTi has a wide range of activation, which is very beneficial to the quick movements of the teeth. The rotated tooth must be fixed to the levelling arch in order to avoid a palatal/lingual movement known as orthodontic side effects. While beginning, start with 012 NiTi, and graduate to 014, 016 NiTi till 16-22 NiTi and finally 18-18 NiTi so that the bracket slot is completely filled. If the patient wants derotation faster and that is the patient’s chief complaint or if a rotated tooth is the cause of crowding and the dentist needs space for levelling and alignment, then first space must be created. The space in this case can be created using an open coil spring mesial and distal to the tooth for which the derotation is to be brought about through which the space can be created and then the derotation can be corrected. After this, the remaining part of the treatment involves using the many fixed appliances at our disposal like couples, wedges, etc. to complete the derotation. Thus, pre-op evaluation of these cases is of paramount importance to carry out the necessary sequence of steps. Once an archwire can be engaged into the bracket the tooth can be brought into alignment. Rotations can also be corrected with the help of a couple system. A couple is 2 forces of equal magnitude but in opposite directions along the same long axis. To achieve a couple, the direction of the rotation is to be decided. For e.g., if the tooth is mesiobuccally rotated, then the arrangement must be made to move the tooth in distolingual direction. This can be achieved with the help of a lingual button which is affixed onto the selected tooth, and a power chain system is used with the help of the adjacent teeth to bring about the desired distolingual force and derotate the tooth. As the elastics are changed at subsequent appointments, the derotation is brought about. Commercially Available Buttons: These are metallic buttons which can be bonded onto teeth as orthodontic brackets are. Fabricated or Custom-made Buttons: To make a custom-made button, a separator or any rubber-like contraption that has a central perforation can be used. The tooth to be bonded is selected and then etched and bonded. Subsequently, the separator is placed onto the lingual surface of the tooth and flowable composite is flowed into the perforation and cured. The separator is then removed and the lingual button is ready. Alternatively, any orthodontic bracket can be used, which does the same trick as a lingual button. Another technique to correct rotation is the use of rotation wedges. They are wedged between the tooth and the arch wire. Here, the archwire ligated to opposite side of the tie wing allows the wedge to act as a fulcrum between the archwire and bracket. An upgrade in this is the use of clear rotation wedges which are preferred by some patients due to their relative invisibility. Another excellent technique is the use of a rotation wedge bonded to a 0.12 ligature wire. An attached wire allows the dentist to ligate the wire to the bracket. Instead of getting braces to correct rotations, we can use aligners as an alternative treatment modality. The recent advancements in aligner therapy have made this possible. Nowadays, aligners come with attachments, so that derotation can be carried out. Attachments used in this case are cosmetic in nature and are bonded right to the tooth and give aligners a way to hold or secure themselves much more securely onto the teeth where derotation is to be carried out. They are made up of a semi-translucent material that camouflages with the tooth, blending in with the enamel surrounding it. Only on close observation can the attachment be seen. With a fairly smooth contour these aligners are able to fit into the attachments, as a result of which the right amount of force is applied in the right direction which brings about derotation. Once the job is done, the attachments can be removed easily from the said teeth and the aligner therapy can be continued. Derotation is easy to perform but very difficult to retain because overstretched collagenous fibres tend to go back to their original positions. Thus, different techniques have been enlisted to achieve retention in this case. The best way to avoid relapse is to start early. The next is overcorrection, a long retention period with the help of hawley’s appliance or bonded retainers can go a long way in achieving predictable success in the treatment. Another very important aspect prior to the retention phase is to achieve a favorable occlusion so that the stability is maintained after debonding and also to achieve tight contacts prior to debonding. This significantly reduces tension in the periodontal ligament fibres, which gives a better result. Long-term stability is obtained by pericision or circumferential supracrestal fiberotomy, where intergingival transgingival, transseptal and semicircular fibres are incised to prevent relapse. Here the incision is made at a 45 degree angle to the long axis of the tooth on the labial and lingual aspects approximately 2 months prior to debonding. Periodontal problems like pocket formation, loss of attached gingiva, and gingival recession don’t occur after circumferential supracrestal fiberotomy. There are different techniques to perform circumferential supracrestal fiberotomy along with the conventional scalpel incisions. They are being discussed as not all patients are open to surgery with orthodontic treatment. Thus, towards the 90s electrosurgery picked up as a technique to perform this task. This caused less bleeding, infection, and gave the same results. Of late dental lasers offer even better results as they offer biostimulatory effects, coagulate blood vessels, seal lymphatics, sterilise the wounds, during ablation while maintaining a clean surgical field. There is markedly less bleeding, post IP swelling and greater patient comfort as compared to other techniques. Do whenever given a choice, the patient must always opt for dental lasers.